Winterthur is renowned for its incomparable Pennsylvania German collection, but few realize that it also has an excellent small group of Moravian objects. 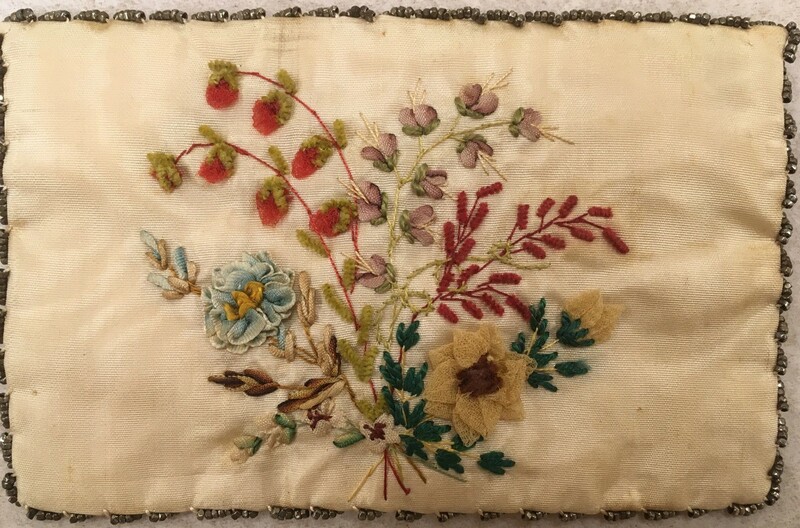 Thanks to a recent research fellowship, l have been able to study the latter pieces that were, in part, acquired by late curator of textiles Susan Burrows Swan as examples of the role fancy needlework played in the lives of young girls attending schools such as the Seminary for Female Education at Bethlehem, Pennsylvania, the Lititz School for Girls at Lititz, Pennsylvania, and the Female Academy at Salem, North Carolina. The Moravian embroidery and paintings we find in today’s museums, private collections, and antique shops often represent needlework and art projects completed by pupils from these boarding schools, including embroidery or artwork that was either sold as souvenirs to tourists visiting the Moravian communities or sent home as proof of one’s accomplishments. Eliza Southgate Bowne (1783–1809), daughter of a well-to-do landowner in Scarborough, Maine, toured Bethlehem in the summer of 1803 and mentioned to her mother in a letter, “We went to a room where they keep their work for sale—pocket-books, pin-balls, toilette cushions, baskets, artificial flowers, etc.” (1) The Winterthur collection contains representative examples of such artwork and ornamental sewing, including this needle case made circa 1819–1827 by a still-to-be-identified Bethlehem Moravian boarding school student. Instead of using yarn or thread to work the embroidery designs, the young girl opted for a ribbon work technique taught by the Moravians. Using specially shaded and dyed narrow silk chiffon ribbons, she raised the design from the ground, creating a three-dimensional, lifelike scene of freshly plucked field flowers. The above smaller “pocketbook” fits into the larger envelope case below and, what at first glance appears to be a beautifully embroidered purse, is really intended to hold sewing needles. Embroidering on paper rather than linen or silk required a great deal of skill as a wrong stitch could not be undone. In 1779 Moravian Elisabeth Horsfield Lindenmeyer (1737–1814) (2) embroidered roses, carnations, violets, and other blossoms onto laid paper, creating a border around the Moravian daily Losung or watchword for September 21, 1779.
among men shall rejoice in the Holy One of Israel. Isaiah 29:19 [KJV]. The use of a Losung began in 1731 when the Moravian leader Count Nicholaus Ludwig von Zinzendorf (1700–1760) began choosing daily meditative verses for his followers. They were published in a booklet and distributed to all members. No matter where one found himself in the world, and for the Moravians that meant everywhere, all were to meditate as a unified body on the designated biblical verse(s) of the day. 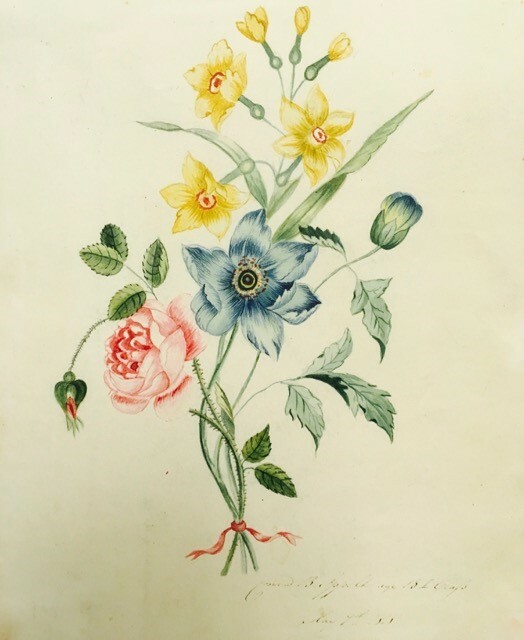 Conrad B. Oppelt of Ohio, age 13, Class II, drew and painted the above watercolor of a fresh bouquet of narcissus and roses tied with a rose-colored ribbon as his art exam exercise on May 9, 1818, at Nazareth Hall, the Moravian Boys Boarding School, Nazareth, Pennsylvania. (6) Similar drawings from art classes/exams frequently became patterns for embroidery on work bags such as the Moravian example below. 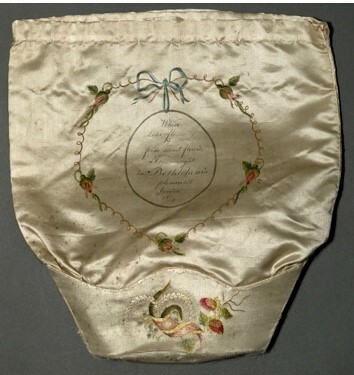 Besides the needlework, the student also painted or penned inscriptions in black on the front and reverse of this reticule: “Where Lehi flows & feeds sweet flow’rs, T’was wrought in Bethlehem’s pleasant bow’rs. 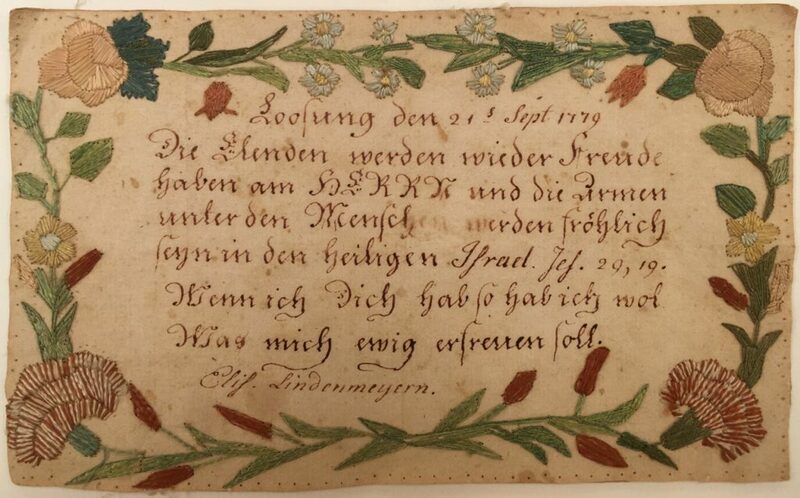 1807,” and “Friendship sweetens the cares of life.” (7) Both boys and girls made birthday greetings, friendship cards, watch papers, quill boxes, etc., and ornamented them with beautifully-wrought ribboned garlands of flowers, adding either inscriptions in Roman script, such as seen here, or in Fraktur script. Winterthur view from top of hill left of Quarry Garden. “Keep this view open forever,” H. F. du Pont, 1962. 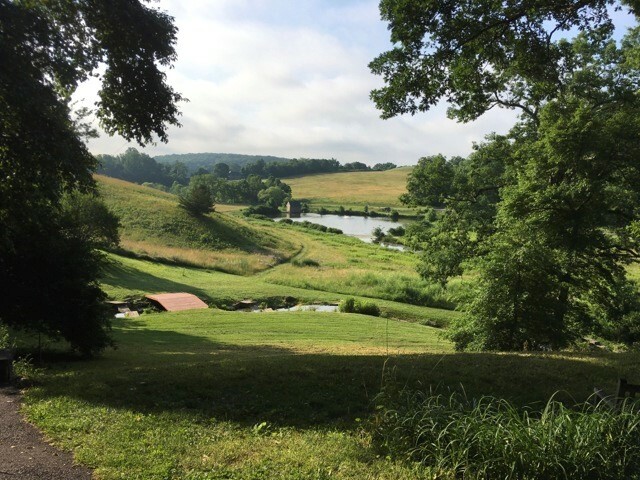 Post by Del-Louise Moyer, a Winterthur Research Fellow who has been researching the incredible resources at the Winterthur Museum, Garden, and Library for a book she is writing entitled Heavenly Fraktur: How Fraktur Influenced Pennsylvania Dutch and Moravian Material Culture. (1) Eliza Southgate Bowne. Letters of Eliza Southgate, Mrs. Walter Bowne. (2) Elisabeth Horsfield Lindenmeyer (1737-1814) was the daughter of Timothy Horsfield, Sr. (1708-1773), a very wealthy butcher from Long Island, who touched by the spiritual teachings of the Moravians, moved to Bethlehem, Pa. in 1749. Here he served as Justice of the Peace, and came to play a major role among those of political and civic responsibilities in the greater Philadelphia area. His daughter was known to be very high-strung, and to suffer from nervous disorders. Elisabeth married the Rev. Henry Lindenmeyer (1728-1817), who served the Moravian churches at Emmaus and York, Pa.
(3) Cunrad Höier. “Ein Trostgebet…aus Meditationes sanctorum patrum, 1587” cited in Philipp Wackernagel’s Das deutsche Kirchenlied…5ter Band. Leipzig: B. G. Teubner, 1877, Nr. 121, 5. Strophe, 84. (4) [Original German] Loosung den 21sten Sept 1779 | Die Elenden werden wieder Freude haben am HERRN und die Armen | unter den Menschen werden fröhlich | seyn in den heiligen Israel. Jes. 29, 19. | Wenn ich dich hab so hab ich wol | Was mich ewig erfreuen soll. | Elis. Lindenmeyerin. (5) Birthday greeting to Jacob van Vleck (3/24/1751-7/3/1831) for 24 March 1795 by Anna Rosel Kliest. Fraktur watercolor Ms. Moravian Archives at Bethlehem, Pennsylvania. (6) Carl B. Oppelt’s watercolor is found in a scrapbook collection of drawings done by the boys of Nazareth Hall for their art exam exercises from 1793-1828 entitled “Drawings by Students of Nazareth Hall.” The drawings were pasted to the scrapbook pages, and on the inside front cover is a printed notice about the school, ca. 1860, issued by Rev. Edward H. Reichel, Principal. Winterthur purchased the scrapbook from Parke Bernet Galleries. (8) Denise Magnani. The Winterthur Garden: Henry Francis du Pont’s Romance with the Land. NY: H. N. Abrams in association with the Henry Francis du Pont Winterthur Museum, 1995, 162. Henry S. Borneman. Pennsylvania German Illuminated Manuscripts. Publications of the Pennslvania German Society, vol. 46. Norristown, Pa.: Pennsylvania German Society, 1937. Eliza Southgate Bowne. A Girl’s Life Eighty Years Ago. New York: Charles Scribner’s Sons, 1887, 13, 172-175, 188-190. _______________. Letters of Eliza Southgate, Mrs. Walter Bowne. Susan Swan Burrows. A Winterthur Guide to American Needlework. Winterthur, Del. :Henry Francis du Pont Winterthur Museum, 1976, Fig. 16, 24. _______________. Plain and Fancy: American Women and Their Needlework, 1700–1850. New York: Holt, Rinehart and Winston, 1995. Ellen Gehret. This is the Way I Pass My Time: A Book About Pennsylvania German Decorated Hand Towels. Birdsboro, Pa.: Pennsylvania German Society, 1985, 58, 273. Mabel Haller. “Early Moravian Education in Pennsylvania,” in Transactions of the Moravian Historical Society. Nazareth, Pa.: Moravian Historical Society, 1953, Vol. 15. Mabel Haller, Clifford Shipton, Howard Brinton & Arthur Middleton. Moravian Influence on Higher Education in Colonial America, n.p., 1958, reprint. Patricia T. Herr. “Moravian Schoolgirl Needlework in Lititz, Pennsylvania,” in The Magazine Antiques 143, no. 2 (Feb. 1993): 308-317. _______________. The Ornamental Branches: Needlework and Arts from Lititz Moravian Girls’ School Between 1800 and 1965 ([Lancaster, Pa.]: Heritage Center Museum of Lancaster County; Virginia Beach, Va.; Donning Co., 1996. ____________________. “19th-Century Moravian Schoolgirl Art,” in Art and Antiques, vol. 3, issue 6 (Nov/December 1980): 78—83. Thomas a Kempis. “Der Herr” in Das Buch von der Nachfolge Christi, Buch 3. Reutlingen, Germany: bey Jakob Noa fischer, 1834, 217-218, Accessed 25 October 2016 at http://bit.ly/2gSNSld. Friedrich Machtholf. “Gebundene Seufzer Eines mit Gott Vertrauten Herzens, gedruckt in 1795” in Karl Friedrich Ledderhoses Leben und Schriften des Gottlieb Friedrich Machtholf, Pfarrers von Möttlingen. Heidelberg: Universitätsbuchhandlung von Karl Winter, 1862, p. 51. Accessed 17 September 2016 at http://bit.ly/2gVXY4S. Denise Magnani. The Winterthur Garden: Henry Francis du Pont’s Romance with the Land. NY: H. N. Abrams in association with the Henry Francis du Pont Winterthur Museum, 1995. Nazareth Hall Collection at Winterthur. Accessed 13 October 2016 at http://findingaid.winterthur.org/html/HTML_Finding_Aids/COL0212.htm. Johann Friedrich Netto. Zeichen-Mahler-und Stickerbuch zur Selbstbelehrung für Damen welche sich mit diesen Künsten beschäftigen. Leipzig: Bei voss und Compagnie, 1795. William C. Reichel. A History of the Rise, Progress, and Present Condition of the Moravian Seminary for Young Ladies, at Bethlehem, Pa…. Second ed., rev. & enl. Philadelphia: J. B. Lippincott, 1874; first ed., 1858, 37; 65; 66; 189-199. Pennsylvania German Folk Art. Publication of The Pennsylvania German Folklore Society, vol. 28, Allentown, Pa., Schlecter’s, 1966. German Folklore Society, vol. 28, Allentown, Pa., Schlecter’s, 1966, 348. Gerhard Tersteegen. Geistliches Blumen=Gärtlein Inniger Seelen, Oder kurtze Schluß=Reimen Betrachtungen und Lieder Über allerhand warheiten des Innwendigen Christenthums; Zur Erweckung, Stärckung, und Erquickung in dem Verborgenen Leben mit Christo in GOtt. Nebst der Frommen Lotterie. In Teutschland zum 4ten Mahl gedruckt; und nun in America das erste Mahl Gedruckt zu Germanton bey Christoph Saur/ 1747, verso of Title Page. Philipp Wackernagel. Das deutsche Kirchenlied…5ter Band. Leipzig: B. G. Teubner, 1877. Candace Wheeler. The Development of Embroidery in America. New York, London: Harper & Bros., 1982, 67-70. All transcriptions & translations by author. This entry was posted in Academic Programs, American Culture Studies, Decorative Arts, museum collection, needlework, Pennsylvania German, Students & Alumni, Textiles, Uncategorized and tagged fraktur, Henry Francis du Pont, moravian boarding schools, needlework, Winterthur Museum Garden & Library. Bookmark the permalink. I suspect I will very soon be using some of your ideas in my tours of the Johannes Mueller house in Lititz, especially that “Moravians had an ebullient love of all living things” and that of their Losung, daily meditation on a pre-selected Bible verse. Thank you so much for your work and your sharing. Del Thank you for sharing your research. Heavenly Fraktur aspiring to the beautiful art work and it’s culture with in the hearts of the Pennsylvania Dutch people. Fraktur, aspiring to the beautiful art work and it’s culture with in the hearts of the Pennsylvania Dutch people.